Combine melted butter and shrimp. On a plate, combine 3/4 cup grated parmesan cheese and breadcrumbs. Add shrimp and cover completely with cheese and bread mixture. Place shrimp on a baking tray and bake for 12-15 minutes until the cheese melts and the shrimp turn pink. Don’t over cook them. When shrimp are ready, place a tortilla on a frying pan and sprinkle with a little parmesan cheese. Once hot, carefully flip it. Add 1/3 cup mozzarella cheese over one half, add 5 shrimp and fold in half. Let brown for a few seconds and flip. Cook for a few more minutes until the cheese melts. Repeat until you have finished 8 quesadillas. Serve immediately. Serve these quesadillas with guacamole or your favorite salsa. Use different kinds of flour tortillas to add a different flavor. Quesadillas are like tacos and that means you can use whatever filling you like. In our house, they make the perfect snack, but many times we make them as the main meal, for lunch or dinner. 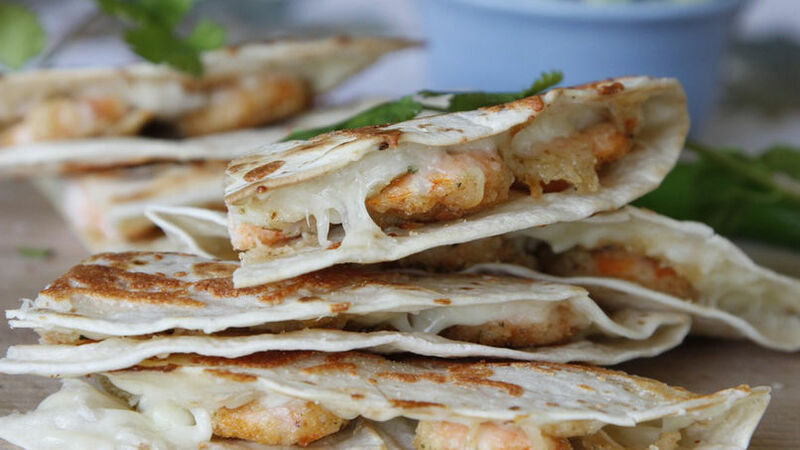 Another one of our favorite flavors is parmesan cheese, and this cheese goes great with shrimp so that’s how we came up with the idea for these delicious and crunchy shrimp quesadillas. Serve them with guacamole or your favorite salsa.